Why build a car out of steel and glass when you can use a few hundred thousand plastic bricks instead? Legoland Florida is opening on October 15th, and Ford doesn't want you to forget it. The Michigan-based automotive company built a very special car as a token of goodwill towards the new amusement park: a Ford Explorer made entirely of Lego bricks. 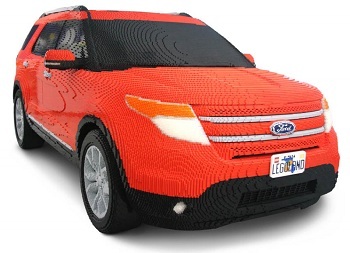 A team of Ford engineers worked tirelessly to put 380,000 Legos together into a reasonable facsimile of the popular SUV, aided by computerized design documents. While purists may scoff and insist that a car made of Danish building blocks is inferior to the real deal, keep in mind that this car probably took more man-hours to produce than a real Ford Explorer. Ford's Chicago Assembly Plant designed and constructed the toy car, which struggles to maintain the "toy" modifier with a straight face. As one of the park's sponsors, the Ford Motor Company provided the car as part of "long-term alliance between Ford and Legoland Florida theme park," according to Erik, a YouTube user who calls himself "yaytez" and covers content for Behind the Thrills. More specifically, the Lego Explorer promotes the park's Ford Driving School, where children learn to simulate a "real-life" driving experience while presumably linking Ford, fun, and safety in a family's collective consciousness. The video takes only 90 seconds to watch, but the actual product took over 2,500 hours to complete. The Lego Explorer will be an exhibit at the park once it opens, but one has to wonder whether it will be there as a piece of art or as a challenge. Can Lego enthusiasts put together something bigger and badder than a full-size, 380,000-piece car? If you're tiny yellow man enough, you're more than welcome to try.